This salmon course was served as the third course in 1st Class. The dish can be served hot or cold. Using a spoon, skim froth from the surface of the melted butter and discard. Allow butter to cool slightly. On top of a double boiler or heatproof bowl, whisk water and egg yolks together with salt and pepper for 30 seconds or until pale yellow and frothy. Over barely simmering water, whisk mixture for 3 minutes or until it draws a ribbon for 5 seconds. Remove pan from heat; whisk in warm butter, 1 tablespoon at a time, until sauce begins to thicken. Still whisking, pour remaining butter into sauce in a slow steady stream. Stir in lemon juice and dill. Allow the sauce to cool slightly. 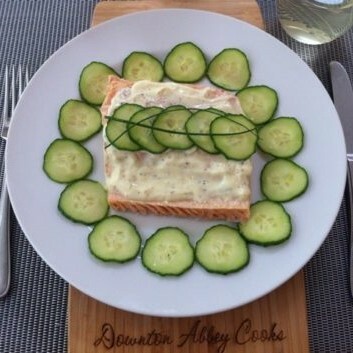 Place poached salmon on warmed plates. Spoon sauce down center of each piece of fish so that the border of the flesh remains visible. Top each fish with 5 slices of cucumber and top the cucumber with more sauce.